In the Ross Gallery, enjoy a display highlighting the artist’s journey from her departure at New York’s Grand Central Terminal through her nine- week island-hopping explorations of exotic flora and lush landscapes. 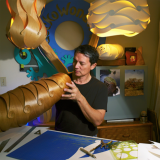 Outdoor installations by contemporary Hawaiian-Chinese sculptor Mark Chai, inspired by the forms of the plants that O’Keeffe encountered while visiting Hawai‘i, are on view in the Leon Levy Visitor Center and along Garden Way and illuminated for evening events. 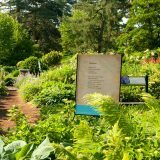 Organized in partnership with the Poetry Society of America, this tour explores the relationship between nature and people in the Hawaiian Islands and highlights the work of contemporary poets in Hawai‘i, including former U.S. Poet Laureate W.S. Merwin.